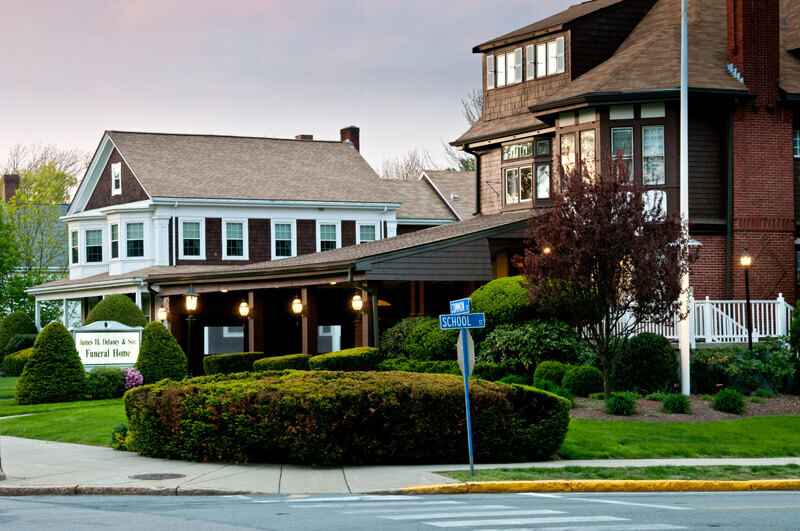 The James H. Delaney & Son Funeral Home was established in December of 1958 at the corner of Common and School Street, one block from Walpole Center. The property at 48 Common Street originally served as a private residence, after John Henry Harshorn, a builder by trade, moved the existing house from the corner in 1898 and placed it on a foundation to the left of Memorial Pond on School Street, to build a home for his wife and himself. The Tudor style home was built on a fieldstone foundation and included beautiful woodwork and leaded glass windows throughout. Sadly, John’s wife and child passed away during child birth and he closed the house up until it was purchased by William Hale in the late 1920’s. Bill Hale was a manufacturer’s representative to New York for the Bird and Son, which was located in Walpole. He and his wife raised their family in the home at 48 Common Street, prior to selling it to James H. Delaney in 1958. After some remodeling, the first floor of the property was converted into a funeral home, owned and operated by James H. “Jim” Delaney, while he and his wife, Ellen, raised their family of four children on the second and third floors. In 1970, Jim saw the need for more space inside the building, adding on the rear addition, and in 1976, he added the front portico to better serve his community. Jim officially retired in July of 1987, after selling the family business to his son, Jay, however, Jim remained active in the funeral home for many years to follow. Jay had come back to funeral service after taking some time away with the Whirlpool Corporation, when he purchased the funeral home from his father. Together, Jim and Jay cared for the members of their community in difficult times. Jay’s son, Jim, began working alongside his grandfather and father in the early 2000s, first part time and later taking on a full-time position. Today, Jay and Jim own and operate the funeral home together, ensuring that the legacy of respect and tradition at the James H. Delaney & Son Funeral Home is upheld.